Kent is famous for being ‘The Garden of England’, so residents are already well aware of the benefits of getting outdoors. There are 180 public gardens to visit and 85% of the county’s land area is classed as green space, including two Areas of Outstanding National Beauty. It will come as no surprise, then, that Kent homeowners place a high importance on their own outside space. Roché have experienced surveyors and installers on hand to serve towns across Kent. 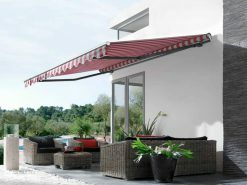 We deliver the highest quality sun awnings in the marketplace; bespoke Markilux and Weinor products with water- and UV- resistant fabrics and features like remote control operation. 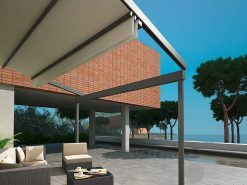 These awnings adapt gardens into all-year-round living spaces, encouraging quality time spent with family and friends. Speak to one of our awning experts to find out more about our awnings in Kent. South England benefits from the warmest climate in the UK, but plenty of rainfall and high winds too – particularly around the coastal towns. These extremes make it important to invest in a high quality patio awning which offers peace of mind across the seasons. 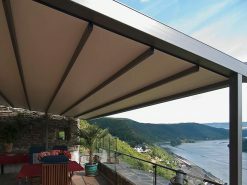 Roché work with Markilux and Weinor to deliver bespoke awnings which are tailored to your home. 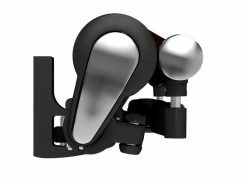 Expect water resistant and UV-rated fabrics in hundreds of different colours, a choice of sensors and remote controls, and a solid aluminium construction. Find out more about the highest quality awnings in Kent here. A veranda awning provides a solution when more stability is required. Their systems have posts and a framework for high levels of support. This makes them suitable for exposed gardens and covering large areas. Other advantages are similar to those of our patio awnings; all-weather protection, hundreds of fabric colour choices and high quality components. Have a question? Ask the Roché team. 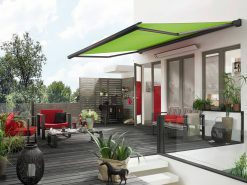 Vertical and conservatory awnings use the same retractable technology as the awnings mentioned above. 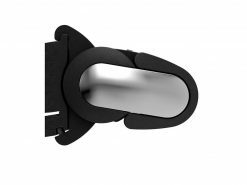 They have been designed to add shading and privacy in the touch of a button. 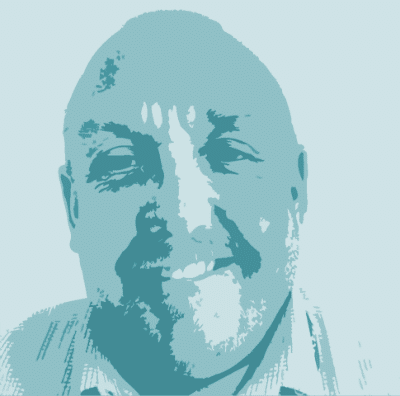 Frank is our main surveyor for Kent. He visits both domestic and commercial properties and will assess your requirements, measure up and answer any questions you have regarding our awnings. He works across Kent, covering districts including Ashford, Maidestone, Dover, Canterbury, Tunbridge Wells and Sevenoaks. If you are interested in finding out more about our Kent awning survey process, speak to the Roché team. They will arrange a date and time for Frank to visit when it is convenient with you. Once he has carried out the survey we will be able to provide you with a tailored quotation. It’s free, and there’s no obligation to purchase afterwards.